What would you be willing to give up to make your dream a reality? Inconvenience and our unwillingness to step outside of our comfort zones often cause us to miss out on wonderful opportunities. Taking action is what separates the dreamers of today from the achievers of tomorrow. For Anthony Walker, beginning a new career was worth the sacrifice he made. Mr. Walker was first inspired to begin a CNC career by his brother-in-law. However, in order to attend Rockford Career College, he would have to move over seventy miles from home to complete the 10-month program. Still, he believed that a better future in his dream career was worth this price. “The biggest challenge was being away from my family in Zion, Illinois,” he says. By comparison, schoolwork was easy. He focused and remained positive, keeping this quote from Jimmy Dean in mind as he progressed through the program: “Do what you say you're going to do. And try to do it a little better than you said you would” (Jimmy Dean quotes, n.d.). Mr. Walker lived by these words, never stopping until he graduated in February of 2019. RCC's Diploma in CNC and Robotic Manufacturing Technology program could prepare you for employment in a variety of industries. Our classes cover an extensive array of topics such as blueprint reading, metallurgy, fixture design and tooling, CNC/CAD turning and milling, and more. As a student, you will gain hands-on experience and put your knowledge to use completing a capstone project. Best of all, you could complete the program in as little as ten months. We hope Mr. Walker's story inspired you. 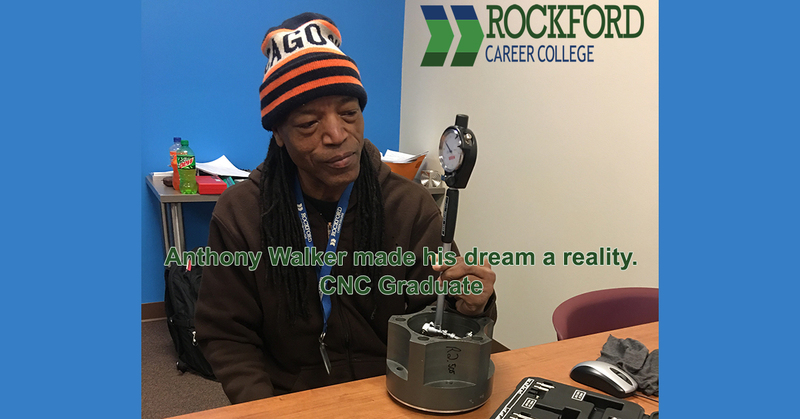 Whether you are interested in the CNC program or one of the many other programs offered at Rockford Career College, please come in and talk to us today to find your career passion. Call 888.680.6682 or submit our Request Information form to learn more.